The government is winning the civil war against the minority Tamils to a background of great power rivalry. China and the United States are competing for influence on this strategic island on the world’s trade routes. After over 20 years of civil war the West deliberately sabotaged peace and the separatist movement by labelling them terrorists. Now they are wringing their hands about human rights abuses. By the year 2002 the Tigers or Liberation Tigers of Tamil Eelam LTTE had fought their way to winning a de facto two state solution for the divided island. This was recognized by a truce sponsored by the United States, the European Union, Japan and Norway. Now the government forces have almost entirely recovered the areas controlled by the rebels. It seems that in western eyes they have been a little too successful. After studiously brushing this bloody civil war under the carpet whilst the issue was in doubt the United States and friends, supported by their media stalwarts, have suddenly woken up to the hundreds of thousands of refuges and thousands of dead in Sri Lanka. The difference with the uproar over the 1400 dead in Gaza and the largely imaginary slaughter in Kosovo ten years earlier is startling. Nothing has changed on the ground but US Secretary of State Hilary Clinton is now attempting to put the brakes on the Sri Lankan government after the United States has done everything in its power to help them to victory. The idea is for them to win but not too easily. Human rights are the excuse for a change of tack. 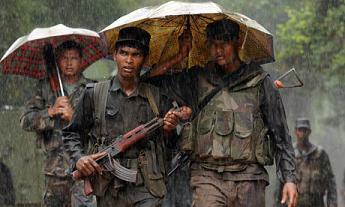 Despite the 2002 ceasefire agreement the US has brazenly supported the government against the Tamil separatists. A major factor has been the demonisation of the LTTE who were declared terrorists in 1997, in the now time honoured way, for independence movements that are not in favour. It is ironic that a year later the United States made the exact opposite decision in Serbia by taking the notorious Kosovan independence movement, the KLA, off their list of terrorist organisations to help them break the Serbian grip on Kosovo. However the US government does not want to seem to be the sponsor of a drastic crushing of Tamil resistance. One Gaza is enough for this year. In additon they want to make sure the Sinhalese government remains to a degree dependant on them. They are also concerned about the unrest spreading to neighbouring India with its large Tamil population. They signed an Access and Cross Servicing agreement in March 2007 that allows US navy ships and air force planes to call on the island. In exchange for basing rights, the US government helped equip and train the Sri Lankan forces. They provided them with the training and high tech tools to win the war. The Americans have their eye on the strategic harbour of Trincomalee on the north east of the island, the best deep water harbour in the Indian Ocean and one of the best six in the world. In 2004 the Bush administration invited the Sri Lankan government for talks but did not invite the LTTE. They then put pressure on the European Union to join them in labelling the Tigers as terrorists. This had the effect of legitimising any action that the Sri Lanka government might take to crush the independence movement and at the same time made it difficult for them to raise money openly and promote their cause. The result was exactly as expected, the Sri Lankan government restarted the war in July 2006 at great cost to the civilian population. The Pentagon has admitted to having provided counter-insurgency training and sophisticated maritime radar used to cut supply links with Tamil sympathisers in India. With allies Pakistan and Israel they have greatly upgraded the government forces. Indeed the sudden and dramatic improvement in the performance of the government forces leads to the conclusion that at some point US special forces of some kind may have been involved. Having successfully stoked up the war the Americans are trying to calm things down. In March the United States seriously proposed landing a brigade of marines supposedly for the purpose of humanitarian aid. The Sri Lankan government declined the offer. India has sent military medical teams but with its large Tamil population and the memory of a previous disastrous intervention, is reluctant to do more. Secretary of State Clinton’s latest statement accuses the Sri Lankan government of “causing such untold suffering” and urges a “political solution”. It has taken her and her advisers a long time to notice. However the Sri Lankan government has insured against fickle US support by building a relationship with the Chinese government. In 2007 they were granted the right to build port facilities and an airfield in the south of the island. In exchange the Chinese have supplied military hardware. As important, with Russian backing, they have blocked the long delayed US initiatives in the United Security Council to discus the “humanitarian crisis”. China rejected this approach, pointing out that it was “an internal matter” and not a threat to international security. As the war winds down with a seemingly complete victory for the government forces the full gush of western humanitarian sentiment will be unleashed on the Sri Lankan government. They will treat this with the contempt it deserves. It took them 25 years to defeat the separatists and they do not intend to accept a political truce now. In addition they are likely to remember who their real friends were at the end.